1.Please must install the driver first, then insert the usb wifi adapter and here is the instruction, please use link below to download the instruction. ★Ultra-speed:Upgrade your WIFI speed to 1200Mbps on 5.8GHz or 2.4GHz bands, excellent for reducing freezing and lags when streaming and gaming. 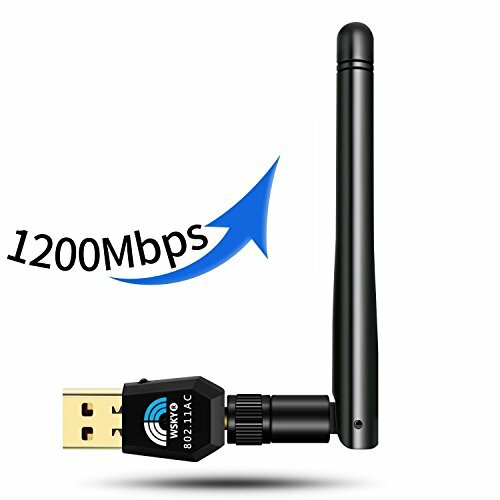 Ultra-fast AC1200 wireless network adapter speed with 802.11AC. ★Ultra-secure:Support WEP/WPA/WPA2/WAPI/WPS secure Tech, Set up a secure, WPA-encrypted connection with a push of the WPS button, free you from remembering long passwords. ★Ultra-powerful:High Gain Long-Rang can help you connect even when signals are weak, Delivers Powerful Wireless AC Technology to Your Desktop or Notebook Computer. If you use our wifi adapter on PC, please make sure connect adapter to the computer back not front. And if you use on laptop, please make sure uninstall the wireless network card, then install our drive. ★Ultra-Compatibility:Works with Any WiFi Routers, support windows XP/7/8/10/MAC OSX/Linux(suitable for Linux common version, not for development version), if you are using it on Wins 10, you don't need to install our driver. ★Ultra-simple installation: Setup mini CD included(Please DON'T insert it into LAPTOP, it might stuck in your laptop, we provide download link for each system below the description); Once you've run the software, you can simply insert the adapter to get connected. We offer 12 MONTH WORRY-FREE WARRANTY, if you have any questions when using, just contact us. We must GIVE YOU the best customer service and Guarantee 100% Satisfaction.